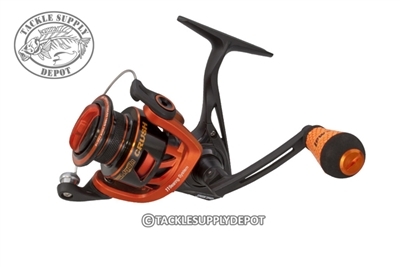 A lightweight high-strength C40 carbon skeletal speed rotor, stainless steel bail wire and smooth six-disc carbon drag system help the line lay on the spool perfectly, and come off just as smooth. The Mach Crush features a strong but lightweight aluminum body, stainless steel main shaft and solid brass pinion gear. Its performance is unmatched because of a premium 11-bearing system with Zero-Reverse one-way clutch bearing. External screws are stainless steel. The spool is double anodized machined and chamfered knurled aluminum that is braid ready. The reel's S-curve oscillation system makes sure line spools smoothly for perfect payout during casts.